Not sure what kind of “spam” messages I am likely to get posting this drink name, but it’s too darn delicious NOT to put on the site! Shake and serve over a large ice cube. You can find this drink, among other greats, on the drink menu at The Wallace, Los Angeles- A fantastic new spot in the heart of Culver City. The food there is nothing short of exceptional (so much so, that I am coming out of my writing drought to discuss it!) and the drinks, although great already, will be getting a fresh spin in coming weeks from their new beverage director- Greg Bryson. The drink listed above is currently my favorite drink in Culver City. From it’s memorable fun name to it’s accessible flavor profile, this drink has everything I could love in it. The bourbon is subtle enough that any type of drinker can enjoy its flavor, no matter what their usual base alcohol preference is. It has a delicious tropical sweetness coming from the fresh passionfruit juice, with no unnatural flavors to it (that tend to come from sweeter/fruity drinks.) It is refreshing, summery and makes me feel like i’m on vacation in Hawaii or the Caribbean when sipped on a hot day! The presentation at The Wallace over a large ice cube also makes it an accessible ‘not too girly’ looking drink option for both men and women., which I think is very smart. In past few visits they have started to garnish it with a pansy (flower), which looks really pretty and a nice alternative to the orange peel. I admit this recipe will be hard to reproduce at home, in particular the ‘chai syrup’ but it’s definitely worth heading in to The Wallace to try it on its home turf. Whilst you’re there, try some of the food too…it’s all fantastic. I would write a review on the whole place right now, but I plan to go back for a 4th visit (in 2 weeks) to try even more food before I write about it. It’s just that good. 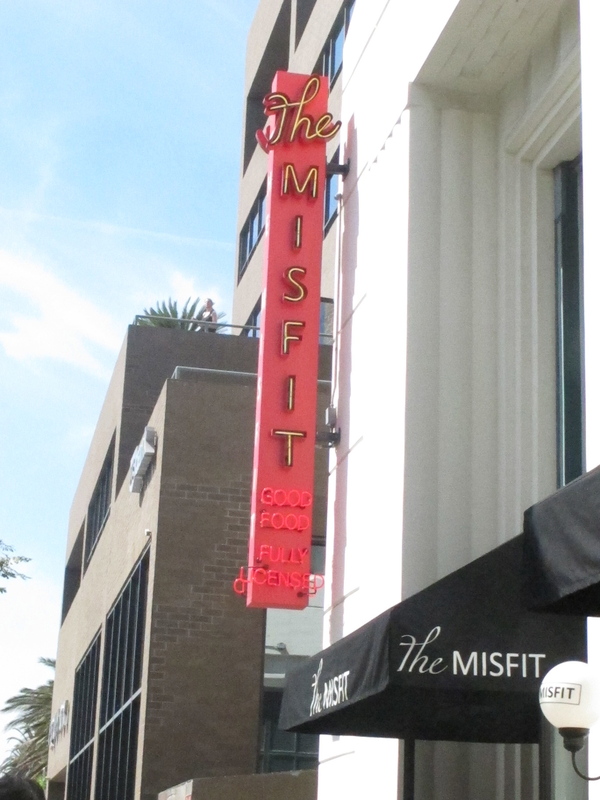 We fit in just great at The Misfit! I have to say, this bar/restaurant is a really great destination in the heart of Santa Monica. The boyfriend (FG) and I headed there this week for a friends birthday and as soon as we entered I couldn’t believe we’d never seen this place before. 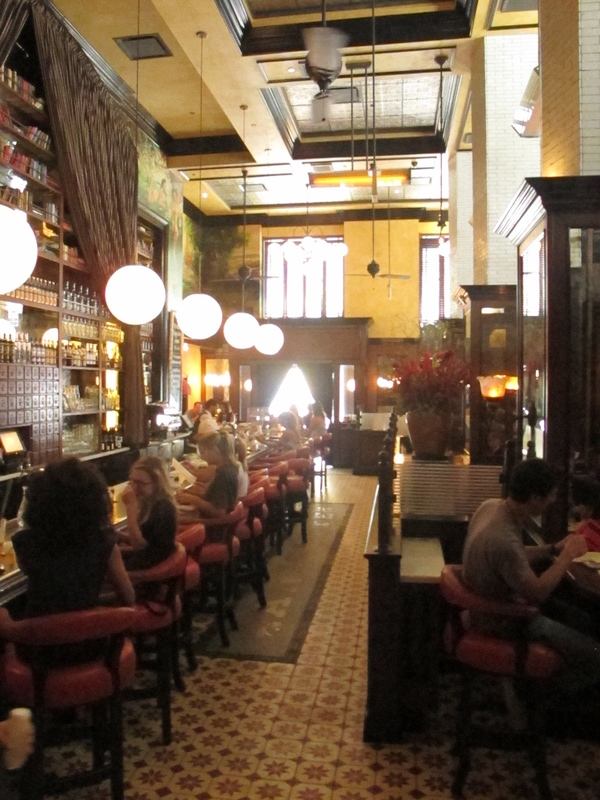 The restaurant itself is visually beautiful when you enter, dramatic high ceilings, a muriel painting behind the bar and tiled floors that made me think of restaurants in Europe. 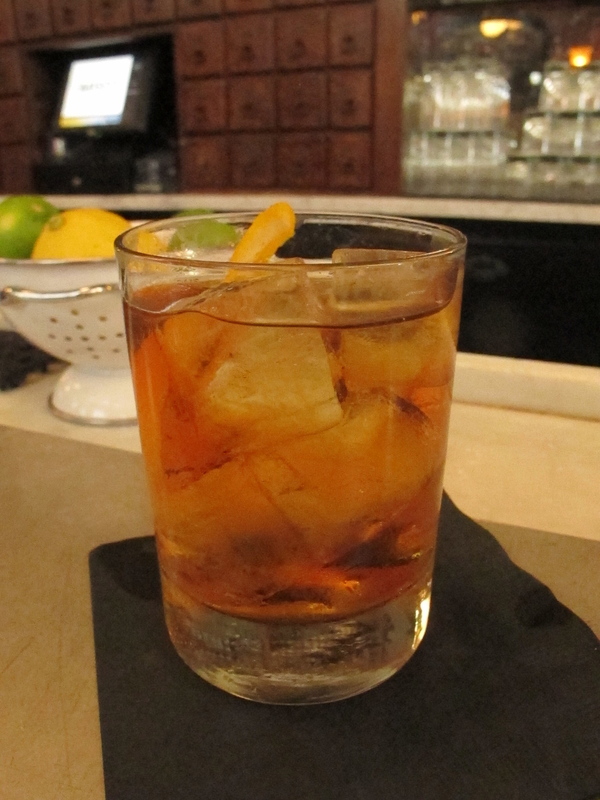 My boyfriend and I are big fans of Santa Monica, FG runs two bar programs off of Broadway, and we have several dinner spots we love to visit in the area, so I was more than happy to find another craft cocktail bar in the same vicinity. 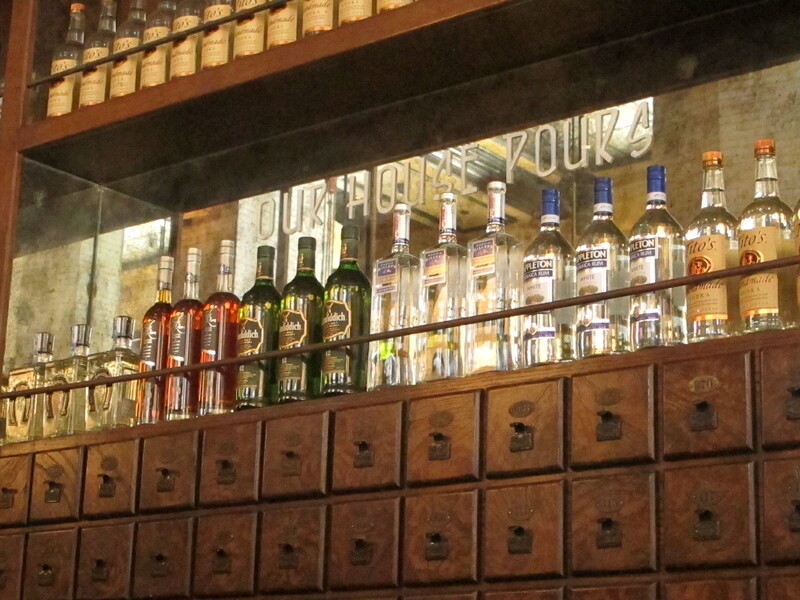 Not only did they have a good looking bar, I must point out their ludicrous happy hour. 12pm to 7pm daily. Yep, thats 7 hours of $5 drinks. 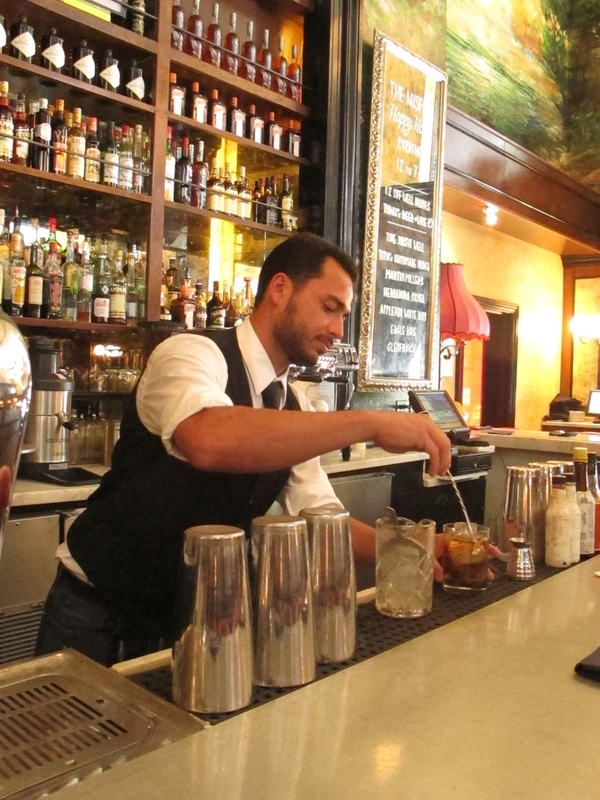 This includes their great specialty cocktail selection as well as their well drinks. I would think this was good either way, but when you factor in what their well includes (see list below) it’s astounding to me this place can stay open. The quality of the products they have in their well puts them leaps and bounds above the competition, although their cost percentage must be insane! In terms of Happy hours in the area, I thought Copa D’Oro was the ruler ($5 drinks nightly), but this well selection for 7 hours daily easily just stole the title of Best Happy Hour in Los Angeles. The first drink I tried was the Bees Knees. It was well balanced, but reminded me of a honey lemon concoction i’d make myself if I had a cold. 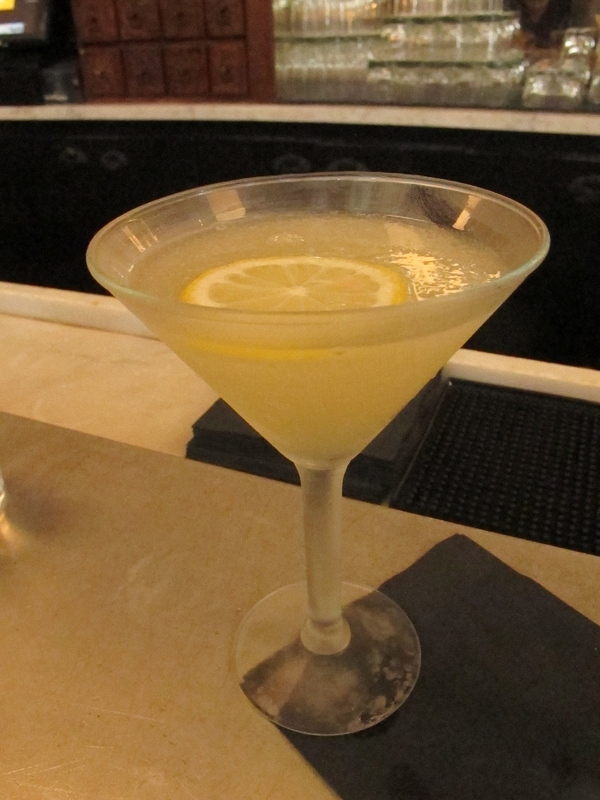 The martin millers gin was a subtle option and didn’t over power the flavors. It was certainly refreshing but the lavender was very subtle, I doubt I would have known it was even in there if it wasn’t on the description. I can’t really say it was watered down, but it tasted very light and although the drink was balanced, it did air on the weaker side…but for $5, really there were no complaints! FG had the ‘Misfit cocktail’. It tasted like a Martinez but with the Haymans it was soft and the juniper wasn’t as intense as other places i’ve had similar drinks. It had a sweetness and weakness to it that I actually rather enjoyed. The food was delicious. I had the salmon on my friends birthday, and then returned for lunch 2 days later so I could have it again- it was that tasty. Beautifully cooked fish that was moist and flavorful with a bbq coating. 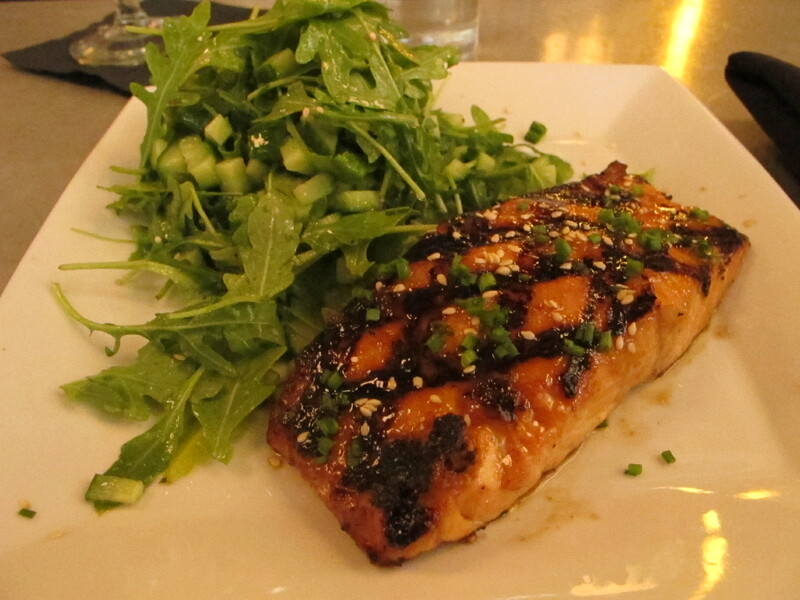 It came with a refreshing arugula and cucumber salad on the side. Perfect for lunch or dinner, I love dishes I don’t have to modify and I enjoyed every bite on this plate. I HIGHLY RECOMMEND! We tasted the Mac and Cheese (which is gluten free and made with brown rice pasta), it tasted great with added Chorizo. It had a little spice from the chile and chorizo that went nicely with the creamy and cheesy pasta. I must say I didn’t get a photo of this dish because my friends devoured it before I had a chance, but I would probably recommend this as a side dish. We tried the roasted parsnips which were crunchy (a little too ‘al dente’ for my liking) but still very tasty. The pistachio pesto was a nice touch and complimented the light flavors of the parsnips. 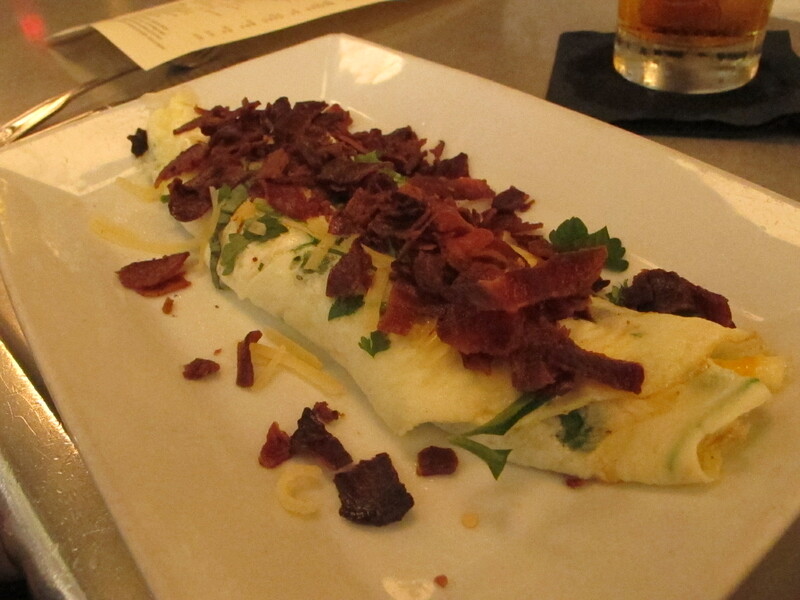 FG had an Omelet with egg white and added pancetta. It was very light and tasty, not a heavy dish at all. A lot of places he has omelets that are way too filling and big, this was just the right balance of ingredients and the pancetta was a nice addition to the dish. Food here gets 4 out of 5 platters. The salmon is divine and i’ll probably return to order it again some time this week, there were other interesting options on the menu that I want to return to try also. The parsnips were just ok, and the mac and cheese was decent. All in all it was pretty good for food, and the rating may in fact increase once I return to try more dishes. Drinks get 4 out of 5 Clover Clubs. None of our drinks were truly spectacular and realistically both our cocktails tasted a little weaker than usual but other than that they seemed balanced and were certainly still enjoyable. The main points this bar gets is for it’s truly fabulous well alcohol selection and it’s insanely long happy hour. Anywhere with a Manhattan for $5 deserves at least 4 out of 5 in my opinion! I definitely recommend popping in to this place when you’re next in Santa Monica. It is attractive, inviting and a great deal. Check it out!